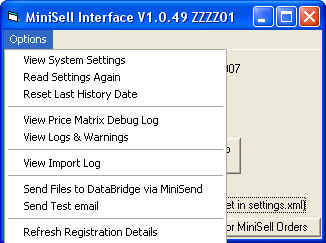 New MiniSell Transactions are imported into Enterprise, using the data files created by MiniSell Databridge. The import program will run MiniFetch, every 30 mins (set in “Settings.xml” file), to fetch any new MiniSell Transactions sitting on the MiniSell server. These will be imported into Enterprise as either SOR,SIN or SQU’s and optionally with hold status or with TagNo set, as stated in the “Settings.xml” file. All items imported are listed in the “import1.log” file, this lists the prices, discounts and GP% of each line. If the transaction total in Enterprise differs from the MiniSell total this will high lighted in this file. It is good practice to monitor this file which summarises all imported data. The program should be installed as the following screenshot shows. Each Exchequer Company, the interface is the Minisell, which is a sub directory of the Exchequer folder. Each company, if more than one company, is named by its OLE code. The “MiniSellInt.exe” program must be running all of the time. This will look for new transactions every 30 mins, and publish data at 6am every morning (or at other times as specified in the setting.xml file). The system will log all errors, major operations, and an audit of the transactions imported into Enterprise. Any transactions, which fail to import, will be moved to a “FAILED” folder and an e-mail can be sent to two e-mail addresses alerting them of the problem (as specified in the setting.xml file). this file lists in detail the transactions that have been imported into enterprise. Important that this file is monitored to make sure prices are correct. ACCOUNT MATRIX discount entries, at group level, must be unique!!! The system will let designated times of the day, export all information to Minisell. 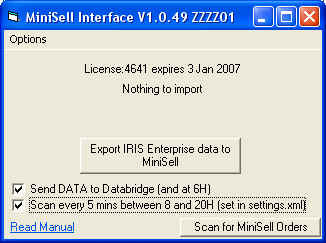 This can be activated manually simply by pressing the ”export enterprise data to Minisell” button. Similarly, the import can be manually set off by pressing the [scan for Minisell of orders] button. The options menu on the main window, allows access to the system settings and various log files created whilst in operation.